It all started a long time ago. 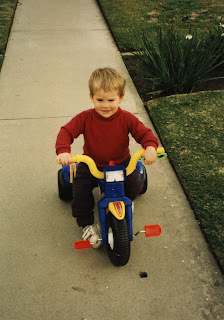 This wasn't exactly his first bicycle, it was more of a plastic thing. He was about 2 years old and not yet know by the moniker "Dance Wilstrong." I heard that there was a crash. 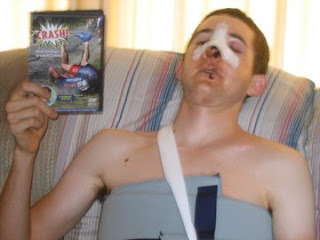 So I asked him, "I heard you had a pretty good crash? How did it happen? 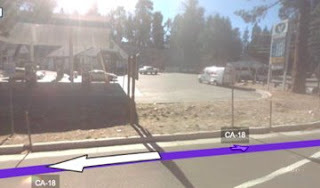 How it happened in his own words: "At Rimforest on CA-18 (28 miles from Big Bear), I was enjoying the scenery, and a car turned left in front of me, I suppose with the sun in their eyes. I hit the front panel (fender) and flew to the ground (I think my bike stayed on the other side of the car). I crawled onto the curb, and many people were suddenly surrounding me, with Dad arriving a few minutes later. The roadside nurse said that I probably had a broken nose and collarbone, and possibly a slight concussion." This photo is from Google Maps, "Street View." How badly hurt are you? Did anyone get any pictures? Half-hour later, I was out of the ambulance and at the Loma Linda emergency room/trauma center, where, after being examined with about 7 x-rays and a CT scan, I was informed that I had a broken nose and clavicle, with many abrasions. We left the hospital after 1am, after being admitted at 6-smthng pm. My nose was reduced (straightened). I am currently wearing some kind of brace, typing with one hand (my right) & am still dirty. I guess my front wheel will need to be rebuilt b/c it's 1-2 inches out of true (tho I have a ready-to-go spare). Are there any more pictures? I was taking lots of pictures, so as to not get to far ahead of Dad, but naturally, I didn't digitally record the crash. The camera is still in my seatbag, which was taken with my bike to the cabin. However, we have some pics on our new camera phone, but don't know how to get them on the computer yet. How personal is your food?